We can take advantage of the essential oils benefits subject to respect strictly the precautions of use. To take full advantage of their virtue, it is recommended to use exclusive Essential Oils Chemotypes (CT), 100% pure and natural, botanically and biochemically defined (H.E.B.B.D.). Essential oils must be produced either from organic farming or from wild cultivation in areas far from polluted areas or from traditional controlled crops in unpolluted rural areas. Essential oils are used in compositions to be diffused in the atmosphere (see the diffusing of essential oils), in cosmetics (mixed with virgin vegetable oils and/or vegetable butters), in massage oils (see essential oils massages), in the bath (see essential oils for the bath) or even in the kitchen (essential oils in the kitchen). Children can benefit from essential oils provided they follow strict dosage rules and under medical supervision (see the page of essential oils for children). How do we choose essential oils? The non-polluting mode of production (we favor producers who use renewable and/or non-polluting energies). The purchase price also comes in the choice of our materials but it remains secondary compared to the criteria of quality. This may explain why, on some products, we are a little more expensive than others. At Huiles & Sens, quality is our preference! The arrival control, the storage method (positive cold), the manufacturing method and the complete traceability of the raw materials (from the producer to the products you find in your Huiles & Sens package) complete our quality chain. Tea Tree Essential Oil: it is anti-fatigue, calming, anti-infectious, antibacterial with broad spectrum of action, antifungal, anti-parasitic, antiseptic, healing, tonic, decongestant venous. The Tea Tree Essential Oil is indicated in the cases of abscesses, skin affection, decay, respiratory comfort, cold stroke with runny nose, imperfections young skin (buttons type), infection of the oral mucosa (aphthae type), skin infection (impetigo type), respiratory infections, sore throat, dandruff, sores and lice. Lemon Essential Oil: it is antibacterial, antiseptic, fluidifying blood, digestive, tonic, protective liver, anti-nauseous. It is indicated in cases of bloating/excess of gas, cold stroke, difficult digestion, flu-like state, fatigue, overweight, sea sickness/motion sickness and warts. Palmarosa Essential Oil: it is antibacterial and anti-infectious major with broad spectrum of action, antifungal, antiviral. Neurotronic, cardiotonic. Positivist. Regenerating skin and capillary. Regulator of sebum production, healing, astringent, moisturizing. Fine Lavender Essential Oil: it is the oil of the 1001 virtues! It is amongst other things anti-inflammatory, analgesic, anti-infectious, light anticoagulant, fluidifying, decongestant, powerful antispasmodic, relaxing muscular, anti-depressive, calming, re-balancing, sedative, hypotensive, cardiovascular, insecticide and vermifuge. See its sheet for his various uses. Ravintsara Essential Oil: it is antiviral, anti-infectious, antibacterial, anti-pain, antispasmodic, relaxing muscular, expectorant, fortifying of the immune system, neurotronic, balancing and positivist. It is indicated in cases of nose-throat, cold sore affections, respiratory comfort, and strengthening immune defenses. We have gathered these 5 cardinal essential oils in a wooden bamboo box. Essential oils really essential, to discover immediately! Essential oils help to treat the small indispositions of everyday life. Besides their curative action, they operate preventively by stimulating the immune system so that your body fights more effectively against bacterial and viral infections. Among the most well-known properties, we have the antiseptic properties. At a time when microbial germs are becoming more and more resistant, which implies for the pharmaceutical industry to find antibiotics more and more powerful (but also more and more destructive of the saprophyte flora responsible for our immunity), Essential oils offer a real alternative. Their effectiveness proves to be stable over time and proof is made every day of their great effectiveness, where some antibiotics now fail. In fact, the antiseptic virtues of plants have been known for thousands of years. For example, men found that certain aromatics such as thyme, savory or cinnamon inhibited the fermentation of food. Today, the antiseptic powers of essential oils are scientifically proven: the Thyme Essential oil in 5% aqueous solution destroys the streptococcus in 4 minutes, the staphylococcus in 4 to 8 minutes and the tuberculosis bacillus in 30 To 60 minutes. To come into action, essential oils must penetrate the body (frictions/massages, inhalation, absorption). Then, it is thanks to the blood circulation that they reach the foci to be treated. In diffusion into the atmosphere, the aromas also address the limbic system of the brain with olfactory signals capable of stimulating "emotions". In doing so, the limbic system regulates the production of immune substances and hormones. What does 100% pure, natural and H.E.B.B.D. terms mean? An essential oil 100% pure and natural has no other substance than that resulting from the plant. It is unmodified or diluted, not deterpenated, rectified or reconstituted. Each essential oil comes from a clearly defined botanical variety. We also talk about essential oil chemotype. The extraction methods used are steam distillation or cold expression for citrus fruits. Are essential oil compositions more effective? Essential oils, when combined with each other, mutually reinforce their active ingredients. It is therefore interesting to associate them in order to obtain a synergy and a potentiation of the desired effect, without exceeding 3 or 4 essential oils in order not to risk to provoke antagonisms. For diffusion into the atmosphere, associations create new fragrances (see diffusing essential oils). With time, you will be able to create yourself real atmospheric compositions! What should I find on the label of an Essential oil bottle? The usual name and especially the Latin denomination of the plant: it alone makes it possible to recognize the exact variety within the botanical species and to avoid confusion due to the variable common names, e.g. Eucalyptus radiata, Eucalyptus globulus, Eucalyptus citriodora. The Chemotype (CT) of the plant: The majority or characteristic biochemical constituents present in the essential oil are the signature of a specific origin or soil of the plant. Geographical origin: depending on country, region, soil, climate and altitude etc. A single plant elaborates different species with well-defined properties. The producing organ or part of the plant: leaves, fruits, pericarps, twigs, bark, wood, flower tops, flowers, roots or seeds produce different essential oils which do not have the same use. The guarantee "Essential Oil 100% pure and natural" indicates that the essential oil is unmodified or diluted, not deterpenated, rectified or reconstituted. When it comes from Organic Farming, an essential oil must show on its label the name of the certifying body. The batch number ensures the traceability of the product. The DLUO (expiry date after opening) must be specified. Symbols and indications of danger. The Eco Emballages logo : our company is a partner of the French program for the valorization of household packaging. How are they extracted ? The most widely used process is the steam distillation. The principle is simple: water vapor is injected into a tank (alembic) filled with the plant whose essential oil is to be extracted. By circulating through plants, water vapor takes charge of its active ingredients. The steam thus enriched is directed into a refrigerated conduit and, in contact with the cold, forms droplets which are collected in a container. The liquid which forms constitutes, on its surface, the essential oil (which is less dense than water). There is nothing left but it must be collected. The rest of the liquid will be used to create a floral water (hydrolat). The other technique, used for citrus (Orange, Lemon ...), consists of pressing their zest mechanically and under cold temperature. A new technology is CO2 extraction. Diffusion into the atmosphere: Thanks to an electric diffuser, the essential oil releases microparticles of essential oil into the ambient air. Besides their therapeutic actions, the essential oils diffused in the atmosphere eliminate unpleasant odors (tobacco, kitchen ...), revitalize the ambient air and bring negative ions. Perfume burners can also be used but, by heating essential oils, they strongly decrease their active ingredients. Ingestion: It is strongly advised, regardless of the essential oil, to exceed the prescribed doses (for an adult, never more than 3 drops per intake and never more than 3 per day, for more information see dosage and duration of treatment). Never absorb essential oils directly. Always dilute them before (in a fatty substance, on a spoonful of honey or in Solub-HE, which is totally natural - and for sale on this site) and let it melt in the mouth. You can also melt the honey or use the Solub HE mixed with the essential oil in a tea or hot water. See also below under "ingestion of essential oils - precautions". Wet inhalation: It consists of breathing (through the nose) of water vapor charged with a few drops of essential oil (not more than 10 drops). If you do not have an inhaler (which you can buy in a pharmacy), you can simply lean over a bowl of warm water with a towel over your head to breathe as much steam as you can. Do not exceed 15 minutes by inhalation. Friction / massage: Applied to the skin, essential oils penetrate the tissues and irrigate the body with blood. One can thus privilege the venous passages like the wrist or the elbow. As a general rule, it is better to avoid applying undiluted essential oils to the skin. It is advisable to mix them beforehand with a vegetable oil (jojoba, macadamia, musky rose, argan, coconut, wheat germ, sweet almond, olive, apricot kernel ...). Warning: Information on essential oils available on our website (dosages, associations, indications) are available for your information. They represent the synthesis of various reference books on aromatherapy. They cannot under any circumstances constitute medical information or even engage our responsibility. This information is given for general information only. For any therapeutic use of essential oils the consultation of a doctor is essential! As for adults: 1 drop per 25 kg body weight, 1 to 3 times daily. An essential oil is effective for a given dose and for a fixed length of time. If an essential oil does not have the desired effect after 5 days, it is preferable to change it (in general, several essential oils can be used for the same symptom). Continue treatment with an essential oil with similar properties. The effects of an essential oil decrease over time and can even reverse if used at high doses. A doctor / aromatherapist may prescribe longer treatments at higher doses depending on the severity of the disease, its age and the intended effect. How to keep essential oils? Essential oils can be preserved for several years. They even tend to improve over time (with the exception of essential oils extracted from citrus zests that cannot be preserved for more than 2 years). Close the bottles after use as the aromas evaporate in the atmosphere. Avoid placing the bottles so that the essential oils do not come into prolonged contact with the plastic dropper (the oils have a corrosive action on the plastic). Place your bottle in a cool place away from light. Keep the bottles out of the reach of children! What are the usual precautions? Essential oils are very rich in active ingredients and extremely powerful. They should be handled with care and used with moderation. Carefully follow the dosages and recommended methods of use which may be different according to the routes of absorption indicated by your doctor/aromatherapist. Do not administer essential oil to a child under 7 years of age (or more for certain essential oils) without the advice of a doctor. Pregnancy and breastfeeding: It is recommended not to use essential oils during pregnancy without medical advice. Some essential oils may have an abortive effect or cut milk. Do not use essential oils as for people with a history of epilepsy or convulsions, people hypersensitive to essential oils, asthmatics, and allergic people. Never inject essential oils intravenously or muscularly. Allergy: It is advisable to perform an allergy test before using an essential oil. To do this, apply a drop of essential oil (mixed with a drop of vegetable oil) in the crease of the elbow. If there is no reaction after 24 hours, you can use this essential oil. Particular attention should be paid to the following essential oils: Ceylon cinnamon, Mint, Litsée and Melissa. Respiratory allergies, Asthma: The use of essential oils in atmospheric diffusion is contraindicated. Sun: Avoid exposure to sunlight and UV rays within a few hours after applying or taking a photo-sensitizing essential oil (Lemon, Orange, Mandarin, Bergamot, Khella). Never apply the essential oil to the eyes, the auricular, nasal and anogenital mucous membranes. Accidental eye projection: Wipe the eye with a cotton cloth dampened with pure vegetable oil or spread one or more drops of vegetable oil on the eyeball. Do not clean with water ! Essential oils are not water-soluble (do not dissolve in water). If poured into a bath or dish, they float to the surface and may cause irritation or burning of the skin. Always dilute them beforehand (e.g. in liquid neutral soap, vegetable oil, honey, liquid cream, Solub-HE). Avoid contact of pure essential oils with the skin. Some are dermocaustic. When used purely, they can irritate or burn the skin (e.g. Cinnamon, Clove, Oregano, thymol thyme, Savory). Consult with a doctor is absolutely necessary in cases of serious illness or extended. Conservation: The shelf life of essential oils is legally fixed at 5 years. Be aware, however, that some species are preserved beyond and even improve over time. The essential oils extracted from citrus zests are used within 2 years for skin applications or in a bath, but can be used beyond this date for diffusion. Close the bottles after use because the aromas and active ingredients evaporate in the atmosphere. Avoid placing the bottles so that the essential oils do not come into prolonged contact with the plastic dropper (the oils have a corrosive action on the plastic). Place your bottles in a cool place away from light. Do not use only 100% pure and natural oils. Be sure to choose essential oils (allergy, contraindications). 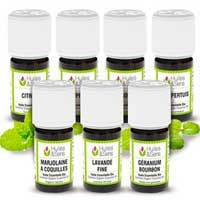 Choose essential oils adapted to be diffused in the atmosphere (especially Rosewood, Lemon, Lemongrass, Eucalyptus radiata, Geranium rosat, Lavandin, Lavender, Lemongrass, Mandarin, Peppermint, Myrtle, Neroli, Orange, Patchouli, Grapefruit, Grain Bigarade, New Year's Pine, Ravintsara, Rosemary, Sandalwood, Pine, Ylang Ylang). Some oils can be irritating to the lining of the respiratory tract, or even neurotoxic if they are used pure or for a long time. Do not distribute in the presence of children under 7 years, pregnant or nursing women, people with allergies or asthma. Never perform continuous diffusion in a closed room. Do not broadcast overnight in the presence of someone who is asleep. Arrange the diffuser so that people do not receive diffusion directly at the level of the face or the eyes. Always keep your diffuser and your essential oils bottles out of the reach of children. Do not forget your pets, which may also be susceptible to spread (even allergic). Generally, it is not advisable to ingest the essential oils. However, if you wish to absorb them, it is important to observe the following precautions: Never ingest pure essential oils without prior dilution (vegetable oil, honey) or on a neutral support (Arom'Pastilles). Do not exceed the recommended daily dose. An essential oil is not a substitute for a varied and balanced diet. Food grade essential oils should also be kept out of reach of young children. Do not use as for pregnant or breastfeeding women, people with a history of epilepsy, people who are hypersensitive or allergic to essential oils without prior medical advice. The information on essential oils available on our website (dosages, associations, indications) are available to you for information. They represent the synthesis of various reference books on aromatherapy. They cannot under any circumstances constitute medical information or even engage our responsibility. Quelle huile essentielle de Lavande choisir ?